My friend Lori rents an apartment in San Francisco and also owned a house in Northern California. As the economy began to spiral, she started emailing me frantically about selling her home. She took the same desperate approach to her finances as many people do. Every day she figured her chances of selling got worse as the recession deepened. As she saw the value of her investment decline, she descended into increasing panic. Each time she checked the numbers on Zillow she needed a Xanax. I suggested she not imbibe the general fear and scarcity of the culture and keep her energy anchored in the Divine as her Source. If she did, her place would sell if it was meant to, regardless of the current market. Release a personal focus. Stop fixating on how much you will win or lose. Instead, invoke a situation where you and a buyer can both win. Imagine the house as a resource you have to offer for the good of all. 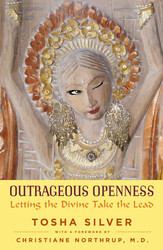 Learn More: Take Tosha’s online course, Outrageous Openness! Call in Divine Order. Affirm that the perfect new owner is already selected and will arrive easily. Know that you will receive the Divinely appointed price from the right person at the right time, imagining someone who will genuinely benefit. Install the Divine as the true owner. After all, where did the house come from in the first place? Did it ever truly belong to Lori? At least give God the credit and mentally return the home to the Divine for resolution. Become detached. Let go of any grasping for outcome. Let go of any attachment to the place or it will block resolution. Detachment creates room for creation. If it’s hard to detach, pray to be able to let go and receive the highest outcome. Know that one way or another, no matter how things currently look, God is your Source and you are safe. After Lori and I spoke she felt a strong impulse to run a real estate post on Craigslist. Every day she invoked Divine Order and affirmed that the perfect buyer was already selected. She also decided that if the Universe wished her to keep the house, the funds to do so would manifest. She became totally detached, insisting that either way the Divine was in control and she would be fine. Two months later she sold the spot, without a broker, through that one crummy online ad, to a grateful couple with a new baby for precisely the amount of money she needed. A collection of spiritual lessons, anecdotes, and thoughts on the Divine’s intervention in our lives, this brilliantly written and wonderfully entertaining book teaches us how to live purposefully and in line with the Force of Love.“What if the Divine is constantly igniting roadside flares to get our attention? What if there actually is a Supreme Organizing Principle with an unbridled sense of humor? And what if we each have this ardent inner suitor who’s writing us love letters every day that often go unopened?” Whether we know it or not, we all experience the touch of the Divine in our lives every single day. Share Should You Try a Mortgage Meditation?